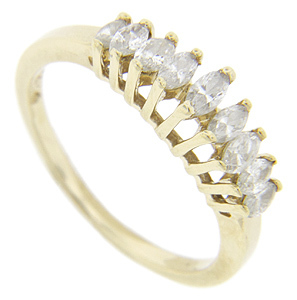 Nine marquis cut diamonds decorate the top of this 14K yellow gold estate wedding band. The diamonds are graduated in size moving from smaller to larger from the sides to the center of the wedding ring. The diamonds are also set at different heights with the center stone set at the highest point. 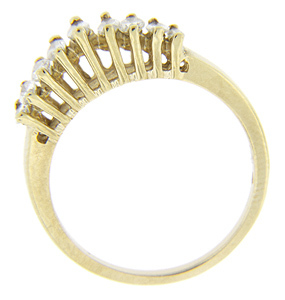 The ring measures 4.7mm in width. Circa: 1980. Size: 6 3/4. We can resize.